If you have been lucky enough to see Trashed, the fantastic film Jeremy Irons has made, you will know it stirs up a heck of a spirit inside you over the hour and a half its playing. It rips out your heart, massages it, prods it, strokes it – pops it back in place and then it beats faster and re-ignites your very grounded thinking and you can’t stop – thinking and doing LESS WASTE! 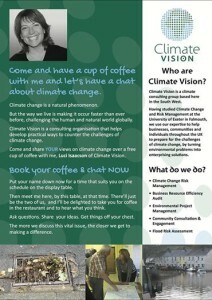 Last year I was invited to watch the film in a small room by the St Dennis Branch of the Cornwall Waste Forum. The next day I asked Canon Philip Lambert if we could show it in the Restaurant in Truro Cathedral. He agreed and last November we saw 100 people watch the film and instantly become vividly inspired and ready for action. A new group was formed, temporarily called Trashed Truro and four meetings have been held. I have to say its actually one of the most exciting things to see, an instant turnaround from all our habits to major action and enthusiasm! The Group have all tested themselves before soon asking the public to do Pledge No 2, to try and buy 2 locally sourced meals a week. It isn’t easy, but the stories that have unfolded in trying are fantastic! It’s impossible to write it how it is. The Inspiring Women’s Network watched the film last week and we had a talk afterwards. The members are like Waste Dynamos – with brilliant ideas being posted on the Facebook page and fantastic messages to’ing and fro’ing. 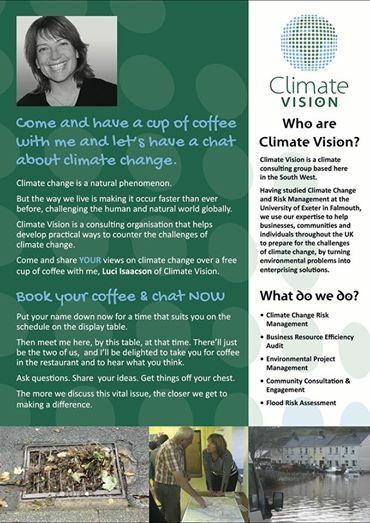 On Sunday (very early in the morning) I was asked to go into Radio Cornwall to talk to Donna Birrell http://climatevision.co.uk/wp-content/uploads/2014/03/Donna-Birrell-BBC-23-3-14.m4a about the Sofa Sessions I have been holding in the Cathedral, The Carbon Fast and Trashed Truro. It was great, you can listen here (until Sunday) from 1:25:15 – 1:36:01 and later on Nourallah Chakroun from The Inspiring Women’s Network was on the same Radio Show talking about the film 2:33-2:42. So the point for all those people not yet involved? You are invited to come to Truro Cathedral, Friday June 6th to see the film – in the Cathedral. Please put the date in your diary. In a week there will be tickets available from the Cathedral Office in Truro 01872 276782. If you are far away – isn’t it holiday time? Come and see us, we’d love to see you. Mostly this is about having a chat, bouncing ideas around and refreshing our habits – please do join us? Competition – any comments to re-make our movie? The competition detail is here – fancy making a movie with us? Cracking news – say thanks? Members of the European Parliament have passed a resolution to promote the protection of the Arctic environment.This is huge and it’s a massive step forward for our campaign! The resolution calls for a conservation area in the waters around the North Pole. It also stresses the need for an agreement in the Arctic Council to prevent pollution from oil drilling (something which, astonishingly, the council currently doesn’t have) and calls for a ban on industrial fishing. Now, I’m not breaking out the party hats just yet – it’s still early days for this resolution and as with all political processes, a lot still needs to happen before we see our goal become a reality. But let’s take a moment to think about how far we’ve come: just two years ago, nobody was demanding a protected sanctuary around the North Pole. Since then, we’ve grown into a 5 million strong movement. We’ve taken part in peaceful protests, signed petitions and joined forces in hundreds of ways to challenge Shell, Gazprom and other Arctic oil drillers everywhere they go. And today, our concerns have made it onto the agenda of one of the most powerful political bodies in the world. That’s pretty amazing. At times like these it’s easy to forget to say thank you, let’s not forget, let’s take the time to say thanks to those people with the job of listening to all ears, understanding all ideas and making massive decisions on a daily basis. They made a great start here and YOU are the ones that can enable them to carry on protecting your world. To do that click here, pop in your postcode, a few clicks and you are there. They want to hear from you, simple, short – from YOU. If you are feeling left out on this massive success – or know someone who ignores all these things but has Grandchildren? You can invite them to sign up here then they have something spectacular to tell their Grandchildren! Now, go out and enjoy yourself, reasons to be cheerful 1 2 3! Prevention is better than cure, I will refrain from using BUT as I think there’s a whole research topic on how many times we use BUT when we talk about Climate Change. Mostly, to be be honest, we can’t be bothered, we don’t want to give up all our luxuries and would prefer it if everyone stopped going on about it. The reality is – you will experience Climate Change in your lifetime, you already are and you see it on the news all the time. Rev it up a great deal and that’s what your young family will be dealing with. Can you think about that for longer than a minute? No – well you possibly are in a club of people who are scared, annoyed, too busy- you know really it’s time to look at YOUR value in the world, your place and how you can live with it – you just need encouraging or the first tool to do something very brilliant. Why not come down to Truro Cathedral today (or if you are outside of Cornwall email us and we will call you)and sign up for a half hour Sofa Session to have a chat about Climate Change (on until Easter Sunday). No-one talks about it for more than 30 seconds. You’d be pleasantly surprised at what comes out when you do! It’s all about you, you are very special, your existence is so valuable, pop along and realise. Yes- fantastic. Sometimes it can be daunting, or we can find many reasons to delete this message now, I would love to hear your thoughts and views and would like to invite you to have a FREE cup of coffee with me at one of the Sofa Sessions in Truro Cathedral on until Easter Sunday and let’s find one new thing you can do and feel even better about the world. These things help us prepare for what is coming and being prepared is KEY for Climate Vision. We have seen trauma and we want to prevent it in YOU. THAT’S IT! So by having a chat, exploring outside the normal box, let’s consider something new. For those Businesses who been affected by the severe weather, between 1 December 2013 and 31 March 2014, are able to apply to Cornwall Council for a 100% business rate relief for three months. Supporting evidence to help us with your applicationApplications can be made by phone, email or in writing.